Jp23 asks: When and why did men start wearing ties? The neck tie has its roots in military history. 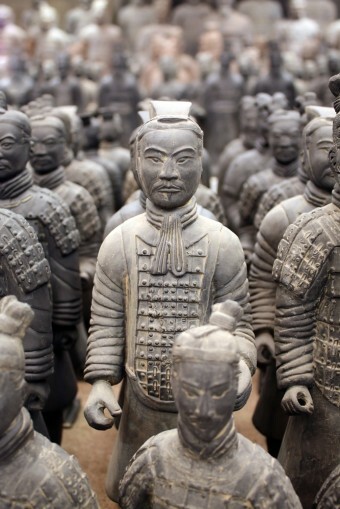 For starters, a collection of terracotta sculptures discovered in 1974 in Xian, China gives insight into the style worn by Chinese soldiers over a thousand years ago. China’s first emperor, Qin Shih Huang, wanted his army to be buried with him as his guardians in the afterlife. Lucky for all the soldiers involved, his advisers convinced him instead to have life sized replicas of his troops made to be used as his protectors throughout eternity. In 210 BC when he died, his terracotta “army” was buried with him in this way. Each statue wore a wrapped neck cloth, the earliest known predecessor of the modern tie. Yet Qin Shih Huang’s army seems to have been the only known Chinese wearers of the neck cloth. There are no known representations of Chinese soldiers or Chinese people in general wearing this piece of clothing outside of this at this time. So historians believe that these neck ties might might have been used here more or less as a badge of honor for Qin Shih Huang’s army. The neck tie is also depicted in Trajan’s column in Rome, Italy. Emperor Trajan ruled the Roman Empire from 98 to 117AD. He was regarded as a military genius and was responsible for the greatest expansion of the Roman Empire. His military conquest of Dacia is commemorated in Trajan’s marble column erected around 113 AD, where thousands of soldiers are shown wearing various styles of neckwear. Again, as was the case with the Chinese, there is no record of other Roman soldiers wearing neckties at this time. Thus, some think that it was also a sign of honor befitting exceptional fighters. During the middle ages, another example of the necktie was worn in a military setting. In the early 1630s, during the Thirty Years War, Croatian soldiers in support of France were presented to the French King Louis XIII. The Croats wore colorful, knotted neckerchiefs as a part of their uniform which attracted their French partners who were accustomed to wearing starched, ruffled collars. Apart from its decorative purpose, the necktie was more practical than these stiff collars and could protect the soldiers’ shirts and buttons. By the time Louis XIV came to the throne, these ties became fashionable in France. Military personnel, French courtiers, and ordinary French people began sporting the accessory in various colors and fabrics. Some people even believe that “cravat”, the French word for “tie”, was even just a corruption of “Croat”, as the style was adopted from the Croatians. Though the cravat is regarded as the true forerunner to the modern tie as a fashion statement, it would take a few hundred years for the tie to evolve to the narrow strip of cloth we think of today as a neck tie. The fancy cravat made its way to England after Charles II reclaimed the throne in 1660. Other aristocrats who had lived in exile in Europe followed him and took along the cravat which became a fashion rage that also spread to the English colonies. The neckwear grew to be a stylish accessory for the well dressed gentleman who wore it in every imaginable color and style. There were cravats of tasseled strings, ruffled collars, ribbon, embroidered linen, cotton, and an abundance of lace. The trend continued into the eighteenth century when donning a cloth around a man’s neck became immensely popular among all men regardless of status. Towards the end of that century, wearing a black cravat was considered the height of fashion. In 1815, the French Emperor, Napolean Bonaparte who typically wore black, wore a white cravat during the battle of Waterloo to honor the Duke of Wellington who favored that color during battle. It was also around that time that people began to refer to a cravat as a “tie” for the first time, of course referring to the fact that the cravats were tied around the neck. Variety in ties, innovation, and complexity in knots were the order of the day. Books and pamphlets were written about the subject. In 1818, The Neckclothitania was published, using satire to make fun of the elaborate cravat styles. In 1828, H. Le Blanc wrote The Art of Tying the Cravat demonstrated in sixteen lessons including thirty two different styles. The industrial revolution from the eighteenth to nineteenth century was the catalyst that led to the necktie as we know it today. “White collar” workers of the day sought comfort and simplicity over previously excessively elaborate dress. Stiff, fancy, hard to tie neckties had no place on the factory floor. Men tied their neckwear four-in-hand allowing for a knot at the throat with two ends of fabric trailing down. This method of tying was a much less intricate way of creating a knot than was necessary when wearing a cravat, and the knot remained secure. It remains a popular way of tying a tie to this day. Around this time also, the idea of wearing a tie to show one’s affiliation developed. In 1880, the first school tie was fashioned when a member of Oxford University rowing club removed the ribbons from his boater hat and tied them four-in-hand. The trend caught on and ties for various affiliations developed. In the 1880s, the ascot tie became the standard for formal morning dress. It was made a famous fashion item by Britain’s King Edward VII, also known as Bertie, who wore it to the horse races and his subjects followed. The name is derived from one of the most celebrated horse racing events in England, The Royal Ascot. The ascot, tie or “bow tie” are still today regarded as choices for morning dress. It was and is still typically decorated with a pin. By the 1920s, the tie was to evolve even more drastically when Jesse Langsdorf, a New York tie maker, cut the fabric at a forty five degree angle using a three piece construction. The gist of it is that this allowed the tie, when tied in standard knots, to drape evenly without twisting, and gave us the modern look. Since then, over the years the width of the tie has expanded and shrunken; the length has grown and shortened; and colors and designs have become brighter and softer, but despite those changes, the style remains substantially the same. The modern tie is even generally manufactured in the same basic way developed by Langsdorf. The Steinkirk, a style of wearing the cravat loosely tied with the dangling end pinned to the breast, became so popular in the early eighteenth century that women began wearing this necktie too, only in more lively colors than the men’s basic white. The bolo tie (also known as a bootlace tie)- made of strips of leather worn around the neck and fastened with a clasp- is the official tie of Arizona, New Mexico, and Texas. There are a number of theories about the derivation of the term “four-in-hand knot” but two common explanations involve horses. One is that British horsemen used this knot to tie a scarf around their neck while holding the reigns of four horses in the other. Another is that the knot with two long ends looked like the reins of the four-horse carriages. There are four main knots used in tying a tie: the four-in-hand, the Windsor, the half Windsor, and the Pratt. But two Cambridge Physicists, Thomas Fink and Yong Mao, used a mathematical formulation to determine that there are actually eighty five ways to tie a tie. I dont know where this from , but I remember my old families often said that using necktie is reflects a hanging man, to make others people felt threatened by our ‘rope on the neck”. In other words, using necktie is symbolyze that you are a predator in a competitive stance. There is also the “bog men” of northern Europe who were sacrificed to Nerthus with a symbolic braided rope around their neck.